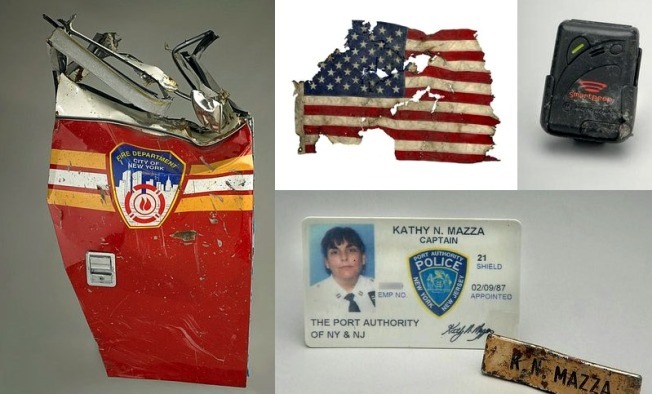 Artifacts from the exhibit September 11: Remembrance and Reflection. One of the least popular pieces of security equipment since the Sept. 11 terrorist attacks is now part of the Smithsonian's collection: a metal detector from the Transportation Security Administration. The National Museum of American History is hosting a temporary exhibit to mark the 10th anniversary of the Sept. 11 attacks. The exhibit, called September 11: Remembrance and Reflection, feature more than 50 objects from New York, the Pentagon and the crash of United flight 93 in Shanksville, Pa. Airplane fragments, a door from a crushed firetruck and that TSA metal detector are among those items that will be displayed on a table in the open with no glass casing. Also on display is the personal beeper of Jonathan Briley, who was an audiovisual technician at the Windows on the World restaurant on the 106th and 107th floors of the North Tower. Briley has been tentatively identified as the subject of the disturbing, famous photo called "The Falling Man," taken on Sept. 11, 2001. The exhibit opens Saturday, Sept. 3 and runs through Sept. 11. The Newseum is also displaying artifacts from the attacks, offering free admission the weekend of Saturday and Sunday, Sept. 10-11.